October is an incredibly busy month for vintage, antique and collectible shows. Recently several promoters have cancelled shows, so it is always a great idea to check their websites to confirm before you travel to a show. Enjoy the wide variety of shows from the finest of antiques to specific collectible niches such as books and toys. Featured October 2016 Vintage, Antique & Collector Show. Westmount Antique/Vintage Show & Sale. Westmount Quebec. Westmount Baptist Church, 411 Roslyn. October 1 & 2, 2016. Davisburg, Michigan. Springfield Oaks County Park, 12451 Andersonville Road. Admission: $6. (children 11 & under free). Early bird admission is $15. Heritage Court/Enercare Centre, Exhibition Place. 100 Princes' Blvd. Saturday,.10 a.m. to 5 p.m. and Sunday, 10 a.m. to 4 p.m.
Bingemans Conference Centre (Marshall Hall) at 425 Bingemans Centre Drive. Niagara-on-the-lake, Ontario. Butler's Barracks, 400 King St. Admission: $7.50 (children under 12 free). 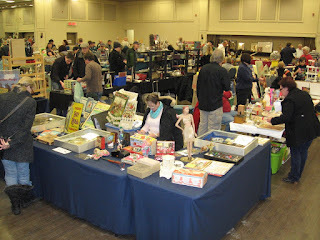 Ottawa Nostalgia & Collectibles Show & Sale. Etobicoke, Ontario. Cloverdale Mall, Dundas St. & Hwy. 427. Antique Tools of the Trades Show & Sale. Vintage and antique woodworking and metalworking tools, and associated books and catalogues. Pickering Ontario Recreation Complex, 1867 valley Farm Rd. For more info call John 905 928 9412. Ancaster Nostalgia and Small Antique Show and Sale. Ancaster, Ontario. Concession Building, Ancaster Fairgrounds, 630 Trinity Road. Centennial Hall, 550 Wellington Street, London, Ontario. Centrepoint Mall, 6464 Yonge Street at Steeles. Toronto, Ontario. One day antique show and sale held on Statutory Holidays. Cambridge, Ontario. Hespeler Arena, 640 Ellis Rd. October 15 & 16, 2016. Port Perry Antique and Vintage Collectible Show. Port Perry High School 159 Rosa St. Port Perry, Ontario. Saturday, 10 a.m. to 4:30 p.m. and Sunday, 10 am to 3:30 p.m. Admission: $5 for both days. IODE Kent Regiment’s Annual Antique Show and Sale. For more information call 519 352 1287. Burlington Ontario Seniors Centre, 2285 New Street. Oxford Auditorium and the Mutual/Market Building, Woodstock Fairgrounds, 875 Nellis Street. 44th Annual Toy Show & Sale. A must attend show by The Canadian Toy Collector’s Society. Toronto, Ontario. Etobicoke Olympium, 590 Rathburn Road. Jordan, Ontario. Harbourside Resort, 2793 Beacon Boulevard. Room-to-room buy, sell and trade on Friday. Show on Saturday from 10 a.m. to 3 p.m.
October 22 & 23, 2016. The Fieldhouse at Carleton University, Bronson and Sunnyside Avenues. Ottawa, Ontario. Marritt Hall, Ancaster Fairgrounds, 630 Trinity Road. Ancaster, Ontario. Hespeler Arena, BeeHive Room, 640 Ellis Road W. Cambridge, Ontario. Toronto, Ontario. Artscape Wychwood Barns, 601 Christie Street. Artscape Wychwood Barns. 601 Christie Street. Toronto Toy & Video Game Extravaganza. Oxford Auditorium, Woodstock Ontario Fairgrounds. 875 Nellis Street. www.Antique-Antique.com present the list of shows for collectors and dealers of antiques, vintage in Ontario Canada.